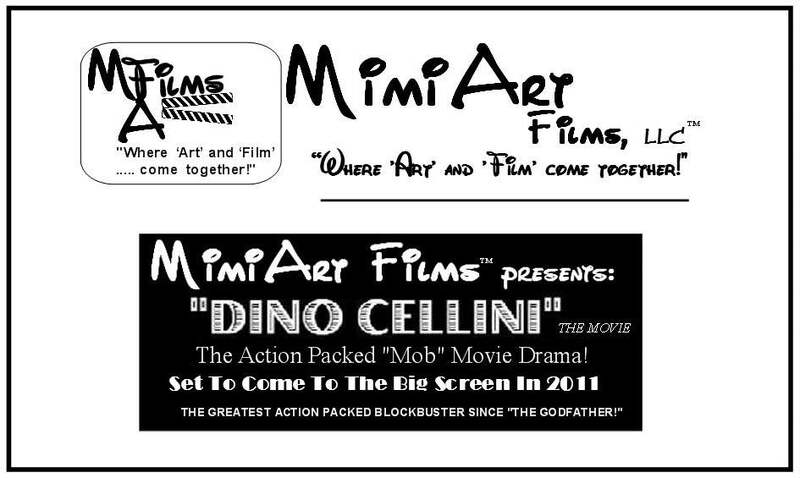 “Dino Cellini,” (The Movie) in 2011! MimiArt Films, LLC is an Art-house independent film company founded in 2006 by a group of movie buffs and independent investors from New York and New Jersey. The name MimiArt was derived from “Mimi,” of folklore. Mimis were vivacious and sagacious spirits of nature that lived in a different dimension. According to legend, Mimi spirits were said to have taught Human Beings everything from how to make a fire, to how to make love. The movie company decided to capture these “All Knowing Spirits of Nature” to their “Art” house company name, and thus the inspirational name of “MimiArt Films” was born. Some have speculated that the company borrowed a page from the Miramax playbook, whereby the company name was a combination of the principal’s parents’ name, but because the combination of company’s two parents’ names could not make a coherent compound word, it is said that the company chose to take Walt Disney’s CEO, at that time, Robert Iger’s parents’ names, “Mimi” and “Art” (Arthur), in the hopes that by combining these two names to form "MimiArt," that this could somehow miraculously transcend the MimiArt Films, Limited Liability Company to the same heights as the Walt Disney Company. MimiArt Films, after several years of wrangling for a competent screenwriter and screenplay, has positioned itself to get its first project off the ground. 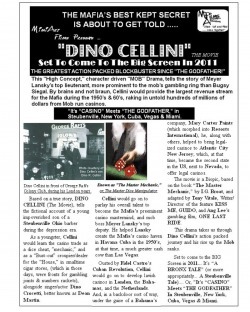 “Dino_Cellini,” is expected to hit the movie screen in 2011! ”Dino Cellini” (The Movie) is based on a true story. The movie tells how an impoverished son of a Steubenville Ohio Barber rose through the "Mob" ranks during the Depression years and became Meyer Lansky's top lieutenant. By brains as a "Master Casino Operator," and not Braun, Cellini’s Cuban casinos would provide hundreds of millions of dollars for the Mafia during the 1950's. The movie is expected to be the next Blockbuster among the likes of "THE GODFATHER,” and is anticipated to hit the movie screen in 2011! This biopic is based on the novel “The Master Mechanic,” written by I.G. Broat. This high profile project was originally set to be produced by award winning producer Sam_Spiegel over 25 years ago. The project was scrapped, however, when Spiegal passed away in December of 1985.